Lebanon is located in Western Asia between latitudes 33° and 35° N, and longitudes 35° and 37° E.
Lebanon surface area is 10,452 square kilometers (4,036 sq mi) of which 10,230 square kilometers (3,950 sq mi) is land. The country is roughly rectangular in shape, becoming narrower toward the south and the farthest north. Its widest point is 88 kilometers (55 mi), and its narrowest is 32 kilometres (20 mi); the average width is about 56 kilometers (35 mi). Lebanon has a coastline and border of 225 kilometers (140 mi) on the Mediterranean Sea to the west, a 375 kilometers (233 mi) border shared with Syria to the north and east and a 79 kilometers (49 mi) long border with Palestine to the south. The 210 km (130.49 mi) long shoreline, rocky in the north and sandy in the south, including several bays and islands (The Lebanese coast) (Al-shawate'). the narrow coastal plain, approximately 3 km (1.86 mi) wide (Al-Sohoul al-sahiliya). the western Mount Lebanon range (Selsilat jibal Loubnan al-Gharbiya). 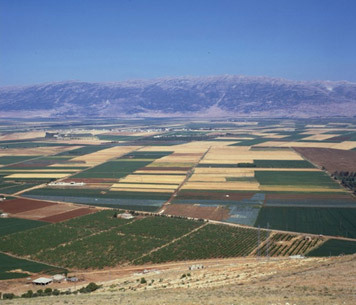 The Beqaa Valley (Al-Sohoul al Dakhiliya or Sahl al Beqa') sits between the Lebanon mountains in the west and the Anti-Lebanon range in the east. The eastern Anti-Lebanon mountains (Selsilat jibal Loubnan al-Sharqiya). 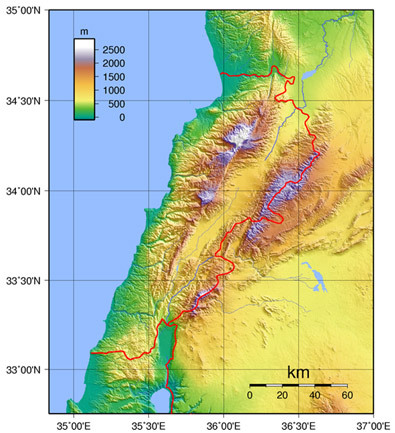 The Lebanon mountains peak at 3,088 meters (10,131 ft) above sea level in Qurnat as Sawda' in North Lebanon and gradually slope to the south before rising again to a height of 2,695 meters (8,842 ft) in Mount Sannine. In 2002 estimated population around 3,677,780, yielding a population density of 372 persons per km2. In 2011 we estimate that Lebanese population count around. 4.140.289.